Ray Buckley is the interim Director of the Center for Native American Spirituality and Christian Study. 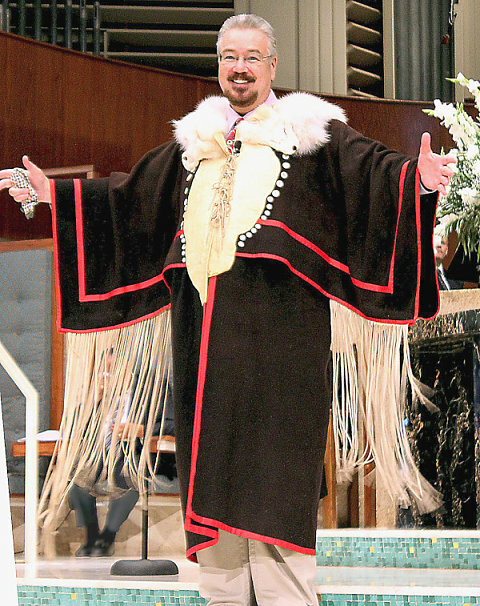 Buckley has served The United Methodist Church as a staff member of The United Methodist Publishing House, Director of the Native People’s Communication Office (UMCom) for nine years, and Director of Connectional Ministries for the Alaska Missionary Conference. Most recently Buckley wrote Hard to Dance with the Devil on Your Back and contributed to New Dawn in Beloved community. Also, he is the author/illustrator of five books: God’s Love is Like…, The Give-Away: A Christmas Story in the Native American Tradition, The Wing, Christmas Moccasins, and Dancing with Words: Storytelling as Legacy, Culture, and Faith. He is also the author of Creator Sang a Welcoming Song, and Walking in These White Man Shoes, children and youth resources for the Women’s Dvision School of Missions. The Give-Away was selected to appear on the CBS Christmas Eve special, An American Christmas, produced by the National Council of Churches. His stories, poetry, and art have appeared in numerous journals, periodicals, books, and museums. Buckley has taught in Nigeria, and Ghana, and served as a lecturer in Native American studies for several universities. Ray Buckley was a keynote speaker at the Jubilee 2000, Cardinal Maeda Institute. At the invitation of the Council of Canadian Catholic Bishops, he has twice appeared on the nationally televised Canadian Catholic Broadcasting Corporation’s Lenten series. In July 2001, Ray was a keynote speaker at the General Synod of the UCC/Disciples of Christ General Assembly. In 2003, 2004, and 2007, Mr. Buckley was a guest lecturer at the Pontifical Biblical Institute of the Vatican. Ray was chosen as the Howard Preacher for Phillip’s Theological Seminary, delivered the McDonald Lecture Series (New Mexico), and the Ira Galloway Lecture Series (Peoria, IL). Buckley was one of five keynote speakers at Youth 2007 (SPLAT), sponsored by the General Board of Discipleship. Author/illustrator Ray Buckley is of Lakota/Tlingit/Scots descent. Ray is one of several Native leaders profiled in As Long As the Waters Flow: Native Americans in the South and East, by Frye Gillard, and The Power of Eagles: Natures Way to Individual Accomplishment, by Twyman L. Towery.